We have heard from our younger Engineering alumni that the opportunities to participate in extracurricular activities like student teams and clubs was just as important as your academics at Queen’s. As you look for ways to stay connected to your Queen’s experience, we invite you to help the next group of students have access to these important experiential learning opportunities. 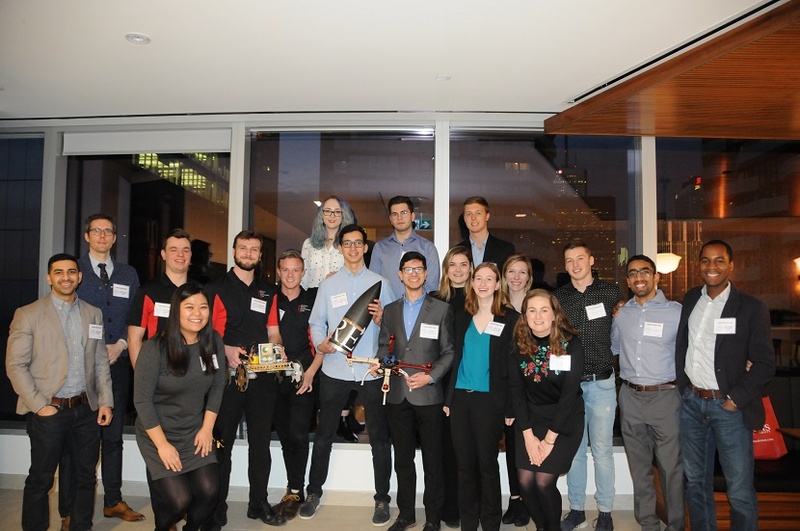 For the past few years, our Queen’s Young Engineering Alumni Group (QYEA), has held the Gael’s Den in Toronto during the Alumni Networking Summit. The student teams pitch for funding to assist with their activities throughout the year. A group of young alumni act as judges and distribute funds based on the strength of student presentations and the potential impact of their projects. This support has been instrumental to the success of these teams. The popularity of the Gael’s Den has meant an increase in the number of teams applying and a need for more funding to allocate towards participating teams. We are asking all our young Engineering alumni to help support this important initiative for our students. It takes a collective effort from the entire alumni community to maintain Queen’s as one of the top Engineering schools in Canada. Alumni donations support initiatives that defined your student experience and create opportunities for generations to come. While some people feel that they cannot give enough to make a difference, every contribution matters. Please make a donation today of any amount to help these student teams! If you are interested in becoming a judge at a future Gael’s Den event please contact Emily Edwards.